RIM Demos PGP Support Package | BlackBerry Blast! According to Tom's Guide Daily, Research In Motion showed their PGP Support package at the recent RSA Conference in San Jose, Calif.
Blackberry has actually been supporting PGP since last October, but sales of the new software have been slow. RIM hopes to improve sales with a new software update. The software, which only runs on BlackBerry OS 4.1, consists of several pieces including client software, as well as a component that can be installed on an enterprise's Microsoft Exchange or IBM Lotus Domino servers. Once all the pieces are installed, users can encrypt and decrypt emails on their Blackberry. 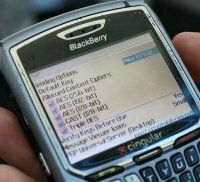 RIM's PGP support will support several encryption algorithms, including AES (128, 192 and 256 bit), as well as Triple DES and CAST. "The typically tricky process of managing public and private keys is handled by the software. Whenever an encrypted email arrives, the screen will show the algorithm and bit strength of the encryption as well as the information whether they are trusted or not. Public keys, used to decrypt the message, are wirelessly fetched from the company's network. These keys are cached by the Blackberry device for 24 hours. If another email is received from that sender after that period, the key will be retrieved from the server again. Private keys, used for the encryption of emails, are stored permanently on the device."